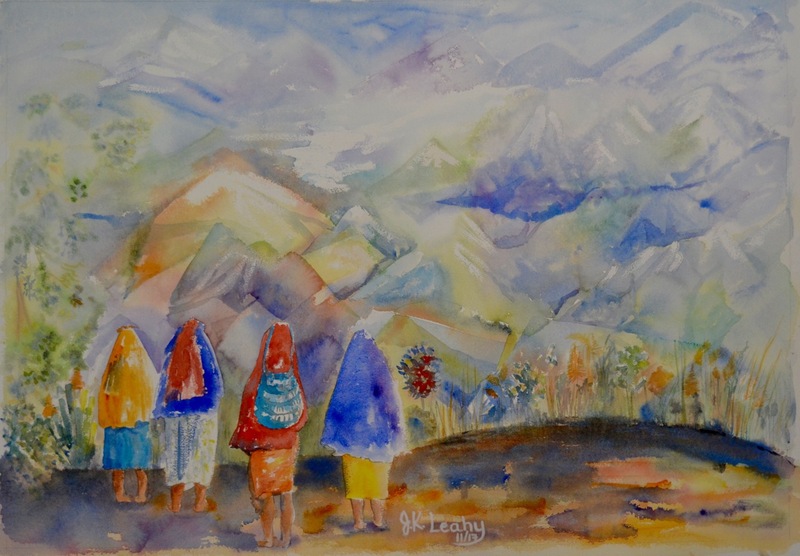 On November 14th, 2017, in Port Moresby, Papua New Guinea (PNG), I will show 50 pieces of my watercolours, mixed media and art studies, making this show the first fine art solo exhibition for any Papua New Guinea female artist. On this final project for the year 2017, I will live my mother, Freda Kauc’s dream. Her dream was that I become an artist full-time. She said I had worked enough (over twenty years as a volunteer) in the capacity of an arts curator for other PNG and Pacific artists. My mother also said, I had the right to practice and show my own art. She also said the general work-place environment for any work was becoming harsh and toxic and she couldn’t see me there for long. I hate to admit it, but she was right. I remember what I wanted to be when I grew up and that was to be a dancer. I danced with my people in our cultural performances and later with other groups from PNG and into the PNG National Theatre company. But, I ended up being a journalist and then a curator. I was scheming on the edges of art making, but I continued to pencil sketch and show my mother. This annoyed her. When I was pregnant with my first son, in 1994, I needed to get out of corporate and relax so I took acrylic lessons every Saturday and really loved it, but drawing was my number one love. We moved to Australia in 2004, and my mother visited in 2006. I started a drawing class, but one student said, “you should teach” so I dropped out and took watercolour class with our community education. I showed my mother the washes. 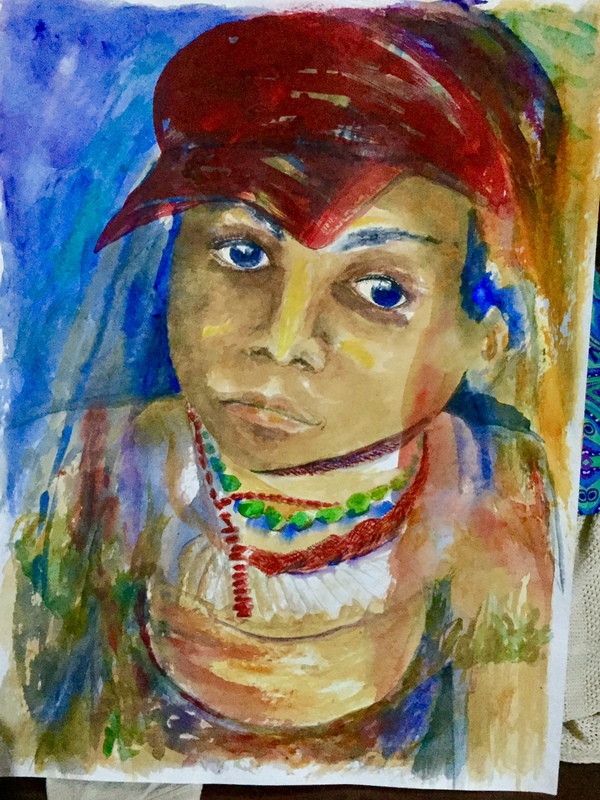 I painted a PNG portrait in watercolour my mother and I named “Agnes” because she reminded us of an Agnes. I sold this picture in an exhibition. My mother told me to make more to sell, but I wouldn’t. I was not confident. Mama came back to Brisbane in 2008, 2010 and 2011 where she made me put some work in other exhibitions. I sold them. Once one of my work ended in an auction and I got more money for it then I thought. “I told you so,” my mother said. I argued it wasn’t enough to pay of the mortgage. In 2016, she came to Brisbane again for a visit and I extended her visa to 12 months. I told her I needed to finish my memoir, and she said I needed to paint. She had a good amount of time on her hands to make me make art while we told stories and i sent away job applications. January 2017, after losing my last pathetic job in administration with an Aged Care organisation, I began my mother’s dream and my new journey with fear and hesitation. I’m still looking for work. I am unemployed and the art takes my mind away to good places. The art making also made the fear go away eventually. The unknown combined with fear of failure gnaws at me but I continue to paint. My mother sat up late into the mornings, knitting her bags while I was painting and washing studies of various subjects as we spoke about the memoir. I posted a few of those washes here, on this blog. The same client went on to say: “You were meant for this work (painting)”. I suddenly realised, I was stopping myself; both the client and my mother were right. I had built a skill for twenty years or more, and not used it to its full potential. I believed ‘work” was in an office. I began working out ways to paint my client’s order and even had to contact Arches in France to get watercolour paper cut large enough to paint on; regular store sizing was too small. Arches referred me to a supplier Parkers, in Sydney. And my son cut a board large enough of the paper. This didn’t fit the dining table, but I could stick it under the trees and paint during the day. It was good to paint in nature and the drying was quick between washes. Six large paintings were done to my own disbelief and off it went to Singapore. The client loved it. From then on, I could not hear the end of my mother’s reminders, and her “I told you so’s”. And soon after the Singapore job, I was invited to show my work at Redlands Performance Arts in the Wantok Melanesia Showcase and now the solo exhibition in PNG. Thank you to this amazing woman, Freda Kauc for making her dream my reality. I’m loving it so much. Thank you Mama. The details of my solo exhibition is on the poster. Part of my sales will be donated to two children’s charity organisation in PNG. I will launch my limited edition art prints on a separate website in December. 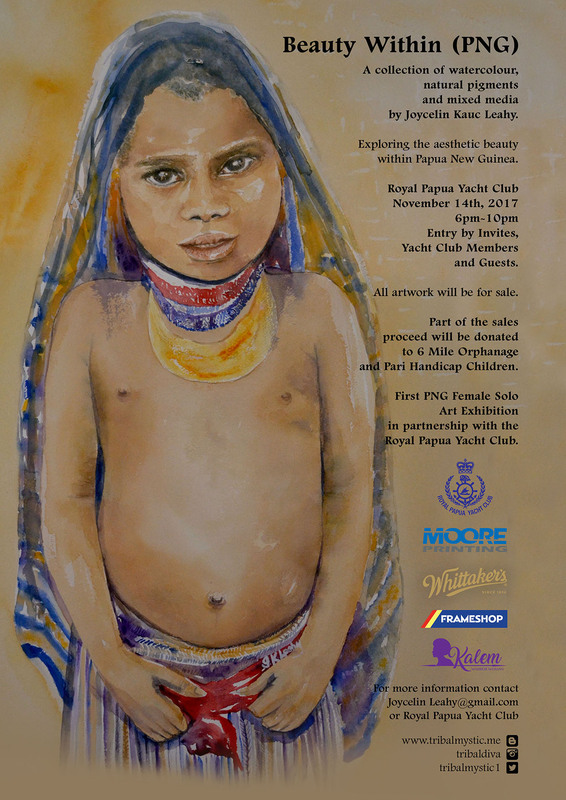 I would like to sincerely thank my sponsors for the First Female PNG Solo Art Exhibition: Royal Papua Yacht Club, Moore Printing, Frameshop, Whittaker, Kalem, Air Niugini, Rocky Roe Photographics, Daisy Taylor, and all friends and family members that have assisted me. (Ps – I will be away from the blog for two weeks from next week).